There are many possible motives for a serial killer, including a desire for attention, to get a sick thrill, or to vent the anger and tight oppression they may be feeling in their private lives. 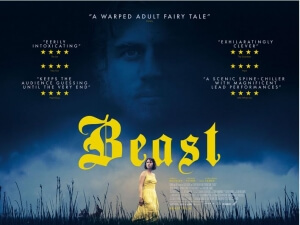 After you see all the things that the main character in Beast goes through, you’ll more or less have a pretty definitive understanding of why she would be increasingly attracted to a darker life, because if I had been unfortunate to experience half of the stuff that actress Jessie Buckley has to deal with in this movie, I’d be about ready to flip too. Buckley is the undisputed breakout star of filmmaker Michael Pearce’s debut feature, in which she plays Mol, a young Jersey native who is helplessly within the firm grasp of her small and oppressive community. Because of a violent incident when she was younger, she has been largely sheltered by her bullish and passive-aggressive family, including her psychologically abusive mother (Geraldine James) who makes her feel like crap for every little mistake she makes. One day, she comes across a handsome and rugged stranger named Pascal (Johnny Flynn) whose mysterious and maybe even dangerous background almost instantly attracts her to him, and against what everyone else around her thinks she engages in a romantic affair with him – only for that to come into question when he is named the prime suspect for a gruesome series of murders around the area. Right away, you can see how absolutely compressed this girl’s life is, surrounded by closed-minded individuals who either want to get with her, like the rather predatory police detective who’s working the case, or in the case of her cruel mother just want to make her life as miserable as possible, and the amount of horrendous treatment she suffers, whether it’s the verbal and emotional abuse by her family and close peers – which only intensifies and gets even nastier when Pascal is brought in for questioning – or the inner psychological torment she frequently breathes life into whenever said abuse happens, it’s enough to make anyone want to go on a killing spree. The movie is much more interested in the psychology of this one character rather than the procedural methods of capturing the killer, and since that’s one of the more fascinating elements of the film it’s a welcome focus, especially seeing how Buckley gives an electrifying and utterly ravenous lead performance as someone who, to use a quote from the movie Network, is mad as hell and is not going to take it anymore. It’s a genius performance that makes you unsure whether to sympathise with her or be more scared of her than the actual serial killer that’s lurking about, and by the end when you have a more definitive answer it’s still so compelling how she brings her character to this point in time. It is a strangely alluring film as a whole, made so by Pearce’s tight and focused direction, and luscious cinematography that captures the often beautiful Jersey countryside whilst at other times making it look like the backdrop of a David Lynch movie, but it’s also a disturbing and morally ambiguous thriller that really takes a look at what can happen to someone when they’re pushed just a little too over the edge. There are scenes in this movie where you see up close the rotting corpses of murder victims, and even they aren’t as horrifying as other scenes where characters are being screamed at, threatened by police, and made to feel like second-class citizens for the most minor of offenses. You can seriously feel the oppression and agonising mistreatment within every inch of Buckley’s character’s body, enough to think that maybe being with someone who may or may not be a murderer suddenly doesn’t seem that bad, but it’s the psychological breakdown as that pressure adds up which proves to be the scariest of all, as we know that she has violent tendencies given the event from her youth, but we’re in the dark as to how she will use them to solve her problems, because it’s pretty much a given that something’s going to happen by the end of it. And how could it not, seeing as how this character goes through so much in this movie, nearly enough to where you’re actually rooting for her to become the monster – or, if you will, a Beast – she is all but guaranteed to become. There are things about it that certainly feel like first-time-filmmaker problems, like an overabundant ending that always feels like it could have ended just a little bit sooner than it does, but as a thorough psychological study it’s an effective watch, and if anything is a proven showcase for Jessie Buckley to show that she has what it takes to become a real star. Beast is an effective and often disturbing psychological study of a severely oppressed individual who becomes attracted to darker manners, and when you see what she goes through – as well as Jessie Buckley’s captivating breakout lead performance – you’ll understand why she’s so close to snapping.